A car beyond your wildest dreams in a masterpiece from the past! Inspired by the Art Deco movement. Created in the preferred collector's scale of 1:24. Operating features include steering wheel that turns the front wheels and doors, hood and trunk that really open and close. Romance, mystery and fate captured in one spectacular car! 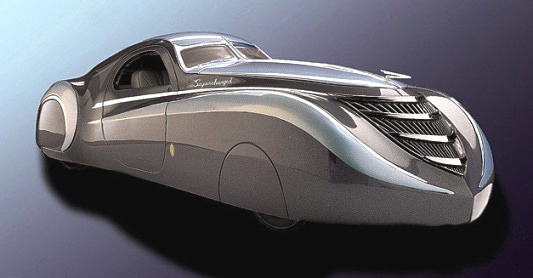 Commissioned by a wealthy French businessman for his lover, the luxurious, one-of-a-kind Duesenberg, along with its designers, mysteriously disappeared during World War II. Amazingly, over 50 years later, the grandsons of the original designers stumbled across their grandfathers' original plans hidden away in a remote barn. They rebuilt the 1939 Duesenberg Coupe Simone, a masterpiece from the past, in the form of an extraordinary die-cast model, capturing all the mystery and perfection of the original. Assembled by hand to capture every nuance, the Duesenberg is a marvel to behold: the bold, sensuous sweep of the fenders, the Art Deco style grille, the luxuriously appointed interior, the alluring paint work. It's the definitive die-cast model of the car that never was...for the story of the Coupe Simone is fiction, created by the designers of Franklin Mint Precision Models.